As part of UK Radon Awareness Week (7th – 13th November 2015), the campaign is today focusing on radon in the workplace. Radon can affect any building in any location. This includes both homes and workplaces. Whilst it is a choice for a homeowner whether they wish to test for radon, there is a legal obligation for employers to assess potential hazards in their workplace. 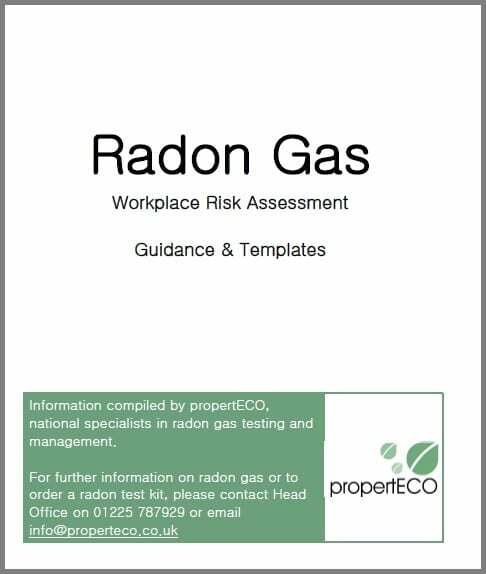 Under the Management of Health and Safety At Work Regulations 1999, all employers must carry out relevant risk assessments, and this includes radon. Many employers are unaware of this responsibility and unsure of how to conduct a radon risk assessment, so we have compiled a complete toolkit to help make the process as easy as possible. The toolkit gives an overview of the hazard, where it can be found and the legislation requiring employers to act, a flowchart to help decide what action needs to be taken and in what order, a template risk assessment form to complete and a template notification letter to send to HSE if high radon levels are detected. Click the document cover to download your free copy of the toolkit or contact us if you would like any specific advice.